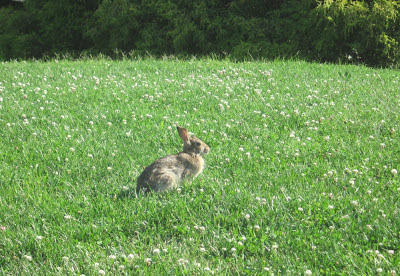 After the tragic destruction of bunny habitat along Rosslyn's 14th St. N., Rosslyn bunnies now prefer to nibble grass in Rosslyn's North Meade St. Park. In an exclusive interview with the Ode Street Tribune, a Rosslyn bunny stated that traffic along Meade St. is scary at times. She wants to see implemented promptly the preferred concept plan that resulted from the Meade Street Bridge Alternatives Study.